A return to Bordeaux late September, and as the harvest was coming to an end, I discovered a rollercoaster season, as written in my report for decanter.com. Botrytis-affected grapes left behind on the vineyard like so many battle casualties after challenging pickings. Unripe grapes within bunches. All the result of crazy weather swings that began at first calmly with a very dry spring, and a precocious flowering. 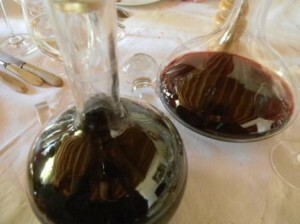 I recall the dry heat in early April, when I tasted the 2010 vintage from barrel – and marveled at the advance of the vine. By mid-June, because of such dry weather combined with warmth and sometimes high heat, everyone was talking about an inevitable earliest harvest of the century, across France almost – whether for Bordeaux and Burgundy, the Loire or Champagne. What made things even worse was an unseen secondary effect of an organic liquid – terpène de pin – whose purpose was to protect grapes from rot. When the sun shined ultra brightly in late June and early July, that liquid, applied on grapes, served as a magnifying glass and made the heat all the more intense. 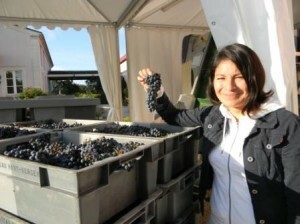 That is what vineyard manager Karin Dubois Reyes told me at Chateau Haut Bergey in Leognan. 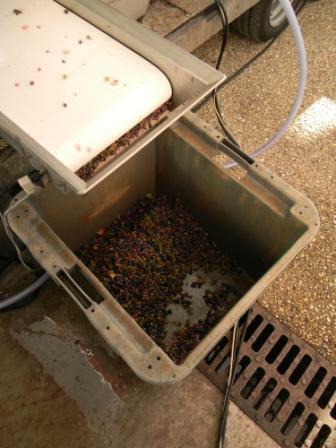 But this excellent estate, like some others in Bordeaux, employed an optical sorting machine that assisted pickers to sort more exactly unwelcome grapes out from any fermentation vat. 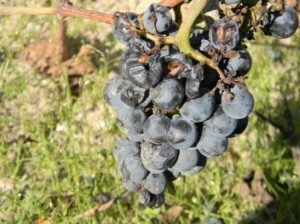 But even the cold and rainy month of July did not help all grapes from the heat shock. 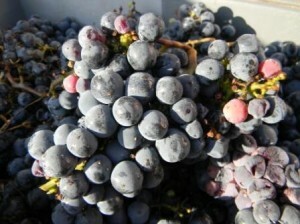 Harvesters in September discovered unripe pink-colored grapes in bunches that were 90% healthy, and this was the case across appellations, all because of the intense heat earlier. So the rollercoaster went from dry and hot to cold and wet… then came August which had bookend rains: in the beginning and in the end, but normal hot weather in the middle. Rain continued into early September, and then a mini roller coaster developed in somewhat tropical conditions: alternating rain and sunny heat: a perfect climate for rot, or botrytis. 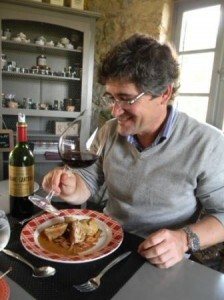 The only reason botrytis did not ravage the vineyards, said Bordeaux oenologist Nicolas Vivas, is because enough dry heat in between the rain put the breaks on it spreading too much. But spread it did in many vineyards, from high end classified growths such as Brane Cantenac to humble growths like Château Venus and Château Grand Abord in the Graves region. For smaller Bordeaux estates – and let’s face it, just barely 5% of all Bordeaux is classified growth and its equivalent – the challenges were even tougher. Mechanical harvesting is more the norm. The key to mechanical harvesting in 2011 was to have workers pick out poor grapes before the machines did the harvest – and then have another look at what the machine brought in, before the grapes went to ferment. 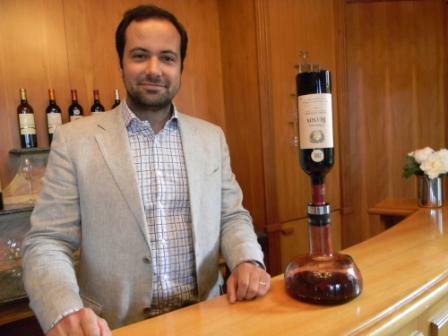 Such was the case at Château Venus for example, a recently established five-hectare estate outside Preignac. Owner Bertrand Amart showed me botrytis-affected grapes (see photo) left behind before the machine began its work. He and others said that Merlot in particular did not ripen as much as its potential, so what seemed unheard of back in 2010 and 2009 is back: adding sugar to reach adequate alcohol levels. Known as chaptalisation, the technique was long a tradition in Bordeaux – and is still practiced – but less in the last few years given later pickings and the probable effects of global warming. Bottom line: if you did not sort, sort and sort again, then you ran the risk of making less than fine wine. What is interesting for lovers of later harvest sweet wines – Sauternes and Barsac being the most famous – is that the spread of botrytis was of course welcome. Although there was uneven ripening here as well because of the roller coaster weather, resulting in less ripe grapes having unwanted grey rot as opposed to noble rot, 2011 turned out to be a very fine harvest for Sauternes. And one of the earliest in memory, as Denis Dubourdieu told journalists at a tasting at Château Carbonnieux in late September. In some cases historically, what is a difficult year for reds turns out to be a very fine or even superb vintage for Sauternes (and vice versa). Vintages like 1982, 1996/1998 and 2000 were very good to great red vintage years, but not particularly great for Sauternes. While vintages like 1983, 1997 and 2001 were quite good to superb for Sauternes but merely good overall for reds. Will 2011 end up being another such “example of opposites”? Why I love Bordeaux. Or, yes, there IS inexpensive Bordeaux that is tasty and pleasurable. As much as I love the charm of, say, Beaune or Dijon, Bordeaux is a big city by comparison – and loads of fun. The weather is more agreeable, as we are in the South more or less, and there is lovely architecture. Sunday evenings some shops are open, even nice wine shops open until 10 pm. This is unheard of in stricter Strasbourg – by comparison. The people are out, the evening is balmy. I met with friend Alex Rychlewski, who has been living in Bordeaux since 1978. He has raised his two children here. “Every public school has bilingual classes in English and in French,” he said. 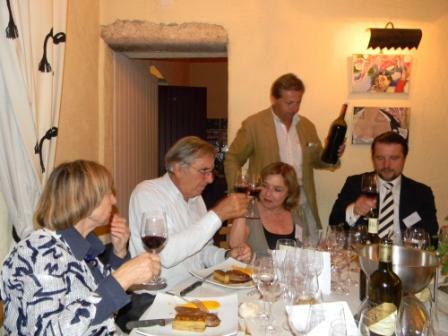 For English speakers, Bordeaux has a long history of association. At least back to Eleanor of Aquitaine and Henri Plantagenêt… In is an important trade centre, still with direct flights out of Merignac. And there is also the wine. And what Alex told me is true. One cannot say that Bordeaux has the classed growths … and the rest is crap. Some people still do. And they are dead wrong. Take our dinner Sunday evening at The Café Regent, for example. This is a rather legendary Bordeaux brasserie that will sadly be replaced by some chain pizza store. Alex was very upset. 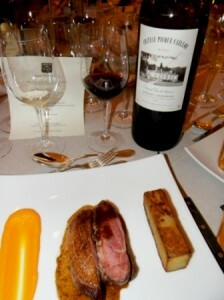 But at least we got a chance to have a nice meal of duck breast with a bottle of Château Chasse Spleen 2006 for just €27. An excellent restaurant price for fine Bordeaux. In fact, that is not much more than what one would pay for the bottle in retail. And in the US, it would have been more expensive. Chasse Spleen is a very well known cru bourgeois from Moulis, but not a classified growth. Much Merlot in the mix and 2006 is an above average vintage. Youngish of course, the tannins were present on the finish, but overall very smooth with the corpulence and tannin serving as a fine foil to the richness of the duck. But as you will hopefully discover, dear reader, my excitement over Bordeaux’s wine does not end with cru bourgeois. There are many other wines in the Graves region for example that cost less than a wine like Chasse Spleen and that merit your wine loving attention: see complete notes HERE. Some of the more humble estates visited included Château des Places, belonging to the Reynaud family in the southern Graves. Brothers Philippe and Fabrice Reynaud sell to large supermarkets and use that money to invest in better equipment, such as finer thermoregulation for their stainless steel vats. 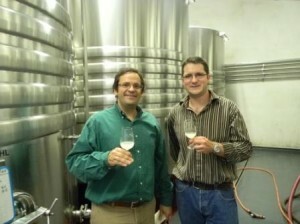 They thanked a wine buyer at Carrefour for his business, showing him the new vats when he visited recently for example. Their second wine – Les Charmes – is aptly described as a charming bistro wine, and for €5 per bottle, the fruit forward taste was just fine. 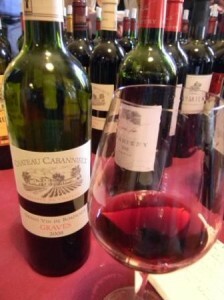 The flagship wine, Chateau des Places, has more Graves character, with tell-tale tobacco aspects, although the oak is perhaps a bit too present at this stage (2009 vintage). Still, for an €8 bottle, just fine.Having said that, they make a special cuvee called Agora, which I find somewhat superficial: modern and made with 100% new oak. It is on one level the caricature of a “Parker wine” because it is over rich. Hardly Graves. They also use some American oak for aging (and flavor). Someone said it reminded him of a Spanish wine! But I have to admit when I tasted the 2010 from cask – almost all Merlot – it reminded me of a very well made Garage wine from the Right Bank: with intensity of flavor and even good acidity balancing the jammy fruit. Maybe Mighty Bob will discover this and send prices sky high, much to the delight of the owners. I prefer their standard cuvee, and their white Graves… which even in 2009 was pretty good, rather thickly peach flavored, even though it contains far more Sauvignon Blanc. At Château Grand Abord, one can procure a lovely 2009 vintage Graves for easily under €10 per bottle. But even better is the 2010 vintage. The wine is mainly Merlot but exudes energy and freshness and plum flavors. What I noticed is the difference between 2009 and 2010 in several domains and it seems to me a similar story at Chateau des Places. 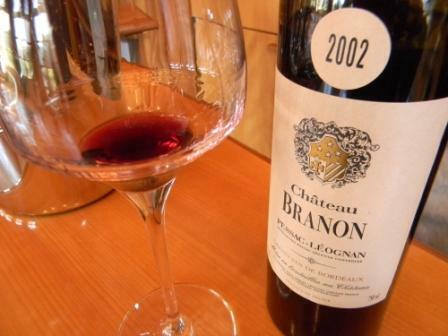 I think it will be interesting to re-visit some of the top Pessac Leognan properties and make a comparison again, especially at Domaine de Chevalier, which at the time of en primeur, I liked 2009 more. 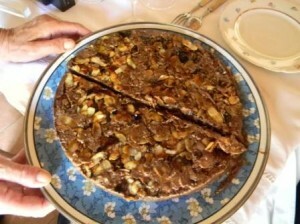 Dinners and lunches were memorable, as usual, when I visited the region in late September 2011. How about a nice à la bonne franquette Monday evening dinner at Chateau Picque Caillou, where owners Paulin and Isabelle Calvet served freshly cut cured ham with a ratatouille and two pan-fried eggs, sunny side up, that came from chickens in their garden. All this talk about organic free-range chickens is true. Just taste eggs from these chickens and you will be a convert. Just before the press tour in the Graves, I enjoyed a delectable lunch at day for lunch was amazing, too, with Henri Lurton and Corinne Conroy, at La Gare Gourmande in Labarde, just near Château Brane Cantenac. It used to be the train station for Labarde but has been converted into a charming bistro with a natural country rustic feeling and excellent cuisine. Customers can also buy local produce from jams to cured hams. The stuffed cannettes were divine, as was the wine: a lovely tobacco and licorice flavored Brane Cantenac 2001, which has softened just a bit but still needs more time to age. Another highlight was dinner at Château Smith Haut Lafitte. 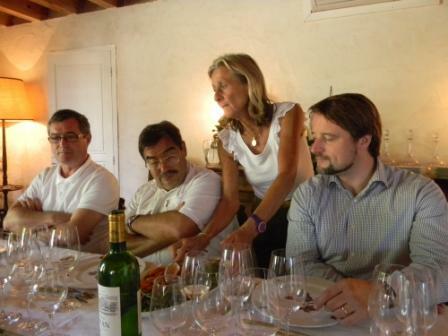 Owners Florence and Daniel Cathiard have put the entire Pessac Léognan appellation – and by extention the Graves region – on the map since constructing a villa like ambiance at their château since arriving there almost 20 years ago. I thought I had seen every nook and cranny of their property, but dinner was served in a lovely white walled room upstairs in one of their many attractive buildings. Dinner was delicious, prepared by one-star Michelin chef Nicolas Masse of the Restaurant La Grand’Vigne, aux Sources de Caudalie. We started off with a fish tartare of what seemed like cod, served with a bit of spicy thick orange-colored sauce from fresh chili pepper. Hats off to Château Smith Haut Lafitte 2008 white, which was at once crisp and focused and rich. A white that will demand time and yet is enjoyable now too. The Château Latour Martillac 2007 white is also a fine wine, but perhaps a bit more gras. Served the next day at Château Carbonnieux from magnum, it is even better. Other wines that impressed over dinner included a fine Chateau de Roulliac 2009 white, which exuded iodine freshness. We had magnum bottles of Château de Rochemorin 1998 white, a bit tired but showing fine acidity along with the leafy earth. One of the highlights proved to be Château Picque Caillou 2000, served from magnum bottles, revealing subtle aromatics and a very pleasing palate with notes of tobacco and plum that went very well with the delectable roated duck, that was served with a perfectly prepared potato au gratin in a rectangle format and a carrot based legumes du moment (photo above). The Château Smith Haut Lafitte 1995 red from magnum was also very enjoyable. During a visit to Chateau Haut Bergey, I had the pleasure of meeting Paul Garcin and his mother who had purchased the estate back in the early 1990s. 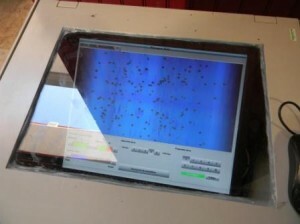 Also interesting was to note that a terpine de pin, which had been used to prevent rot actually magnified the effect of the burning sun in late June (everyone used it, said viticulture manager Karin Dubois Reyes) so that it accentuated the heat stress on the grapes, explaining why some grapes in bunches never recovered. After a tour of the chateau – during Paul showed me how special water was being used to keep regulate temperatures of the steel vats (the water freezes at minus 4°C), how the château plans to increase the density of plantings, how the pneumatic press is kept oxygen-free – I tasted some wines. We started with the second wine, L’Etoile, from the 2002 vintage. I liked the cranberry freshness, chipper aspect and smooth palate. A fine drink and a second wine to seek in 2002. It was a challenge to taste Haut Bergey 2003, but the wine lived up to the challenge as one of the better Graves I have ever had from this difficult vintage. Its nose was marked by black sweet licorice and dark fruit, the attack was OK, a tad thick, but the mid palate was fine and flavorful. A pity that the finish was just a bit abrupt. Overall, however, considering the vintage, a fine effort. I appreciated the Chateau Branon 2002, which is always aged in 100% new oak… I wonder if it would be better to use less new oak, but it was a very fine drink. Very Graves with tobacco notes. Kudos for a very fine Chateau Haut Bergey white 2009, which at 14% did not seem heavy, and seduced me with notes of white peach and apricots. Semillon like even though mostly Sauvignon Blanc. From memory, the 2008 white is also very good. 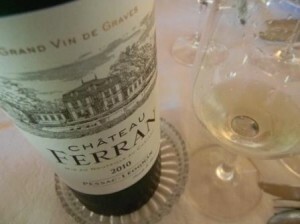 Another fine white from 2009 – no hesitation – is the Chateau Sartre. Nothing to do with the philosopher but named after a nearby river not far from Leognan. This wine was very fresh and rich and flavorful. 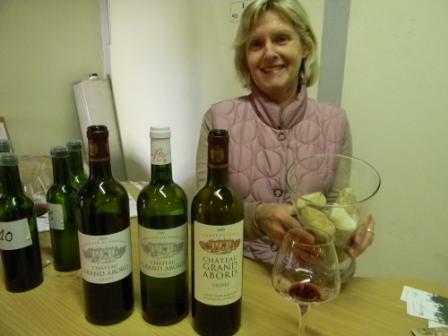 I was very surprised by the quality of many white 2009s, even though some – such as Chantegrive in Graves Cuvee Caroline, which I normally like, tasted a tad heavy. Not so for the red Chantegrive in 2008, which was one of the better 2008s from Graves. Some red 2008s were a bit tough to taste at this stage, with a closed in character, such as La Louviere, which I could not score. Neighbor Rochemorin however was far more approachable and tasty. Other reds I liked included Chateau Magence in the Graves region, which I will seek out to be sure, along with Larrivet Haut Brion and Latour Martillac… COMPLETE NOTES HERE. My first visit ever to Chateau Ferran on Wednesday 28 September, after the Larrivet Haut Brion tasting of Pessac Leognan wines, near Larrivet Haut Brion. 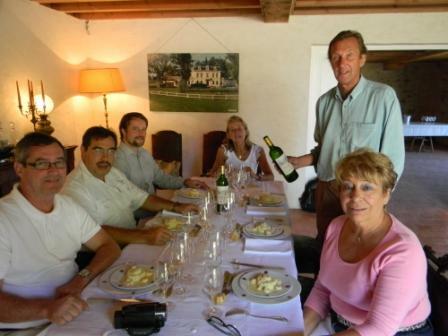 Philippe Lacoste, who is part of the Mahler Besse family – and part owner of Chateau Palmer – along with wife Ghislaine welcomed us for lunch. A delicious 2010 white was accompanied by foie gras de duck on toasts. Delectable in a delightful country farmer like environment, encased in stone walls that kept us cool from a rather hot afternoon sun. We then started lunch with a delicious courgette and shrimps in a light cream sauce. The Ferran 2005 red was drinking very well as was the 2001, although that vintage tasted older than its years, it was still very good. 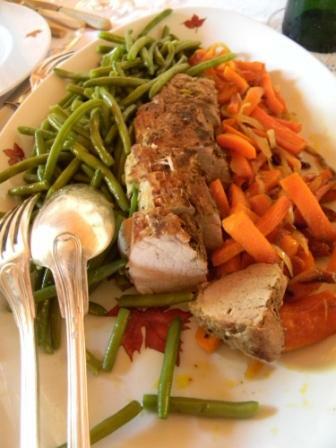 Served with filet mignon de porc in a light honeyed sauce, with string beans and carrots. Delicious. But what perhaps stole the show was an amazingly good chocolate mousse based cake topped with salted almonds, which because they were baked, had a slightly caramelized aspect… I really wanted to have another piece but I glanced at my waistline and declined, politely with some remorse. Here’s hoping for some great 2011 Sauternes – it’s about time the sweet wines were the centre of attention! The title of your blog: (The 2011 Bordeaux rollercoaster: hard work will make fine wine – Connections to Wine) seemed intresting so thats how I ended up here! Many thanks. Glad you enjoy my texts.